Nylon wheels are an excellent choice for out light to medium duty casters. These caster and wheel combinations can handle up to 450 lbs of weight each, so they are very durable and practical. The nylon wheels are perfect for applications that are high humidity and moisture, or if you have to steam clean or wash down your carts, dollies or equipment regularly. the nylon wheels coupled with stainless steel casters and bearings are highly resistant to chemicals, water and corrosives. Whether you need swivel, rigid plate mount casters, we have a great selection to chose from. They are a standard in laboratories, medical and food industries and clean rooms. There are also high temperature nylon wheels available for autoclaves and ovens. 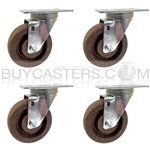 These are high quality casters and wheels at great prices and are ready to be assembled and ship out of one of our warehouses.